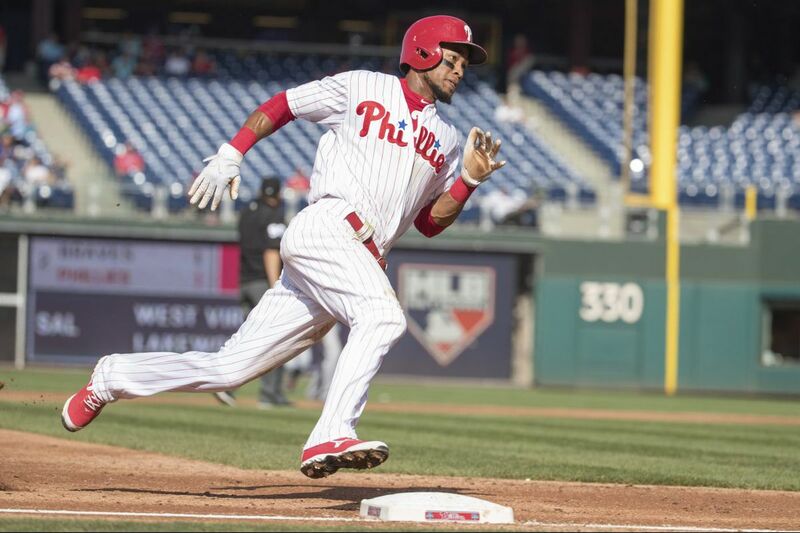 Phillies Pedro Florimon runs toward third base during the second inning of the second baseball game of a doubleheader against the Braves on Wednesday. MIAMI – Pedro Florimon spent the majority of the last four seasons playing in towns like Rochester, Toledo, and Charlotte. He kept his baseball dream alive on minor-league bus rides across the International League. He played a few weeks each year in the major leagues, but it was just a taste of the full-time role he once had. The Phillies promoted Florimon in mid-August and he will finish the season with his longest stint in the majors since 2013. Florimon is making the most of his chance, impressing Phillies manager Pete Mackanin enough that the he frequently praises Florimon without being prodded. Florimon, who has proven to be capable of filling a utility role, may be doing enough to keep himself off those long bus rides. "In my mind, I always thought that I would be back here soon," Florimon said. "The big leagues. Everyone wants to be here. It happened and now I'm here." The Phillies will likely part with Andres Blanco, who is a free agent after the season. Blanco has been the team's utility player for the last three seasons. They could fill his void with Florimon, who has already played six positions in his first 14 games. Jesmuel Valentin, who had season-ending shoulder surgery in May, will also be a candidate. Valentin is eight years younger but may need some more time at triple A.
Florimon entered Friday with 14 hits in his first 44 at-bats. He is an infielder by trade and played sparingly in the outfield before this season. But he has played displayed an ability to command all three outfield positions. "He could be a good guy to keep around," Mackanin said. "He's sure-handed and has good instincts. He's like Freddy. We can put Freddy Galvis anywhere and he'll play well there. Florimon seems to be the same way. He's a switch-hitter. He's an average runner. He has occasional power. He's a steady defender, which is good to have." Florimon was in Norfolk last month, finishing another game in another International League town. And then Lehigh Valley IronPigs manager Dusty Wathan called him into his office. Florimon was headed back to the majors. "It was great. I was excited," Florimon said. "Nobody wants to play in minor leagues for so long. Now I'm here. I don't know where I'll be next year but I'm going to play the best I can while I'm here. If they give me the opportunity again next year, then I'll be here." Jerad Eickhoff had an MRI on Friday in Philadelphia. The results, which should be available Saturday, will determine if Eickhoff will return this season. He's on the disabled list with nerve irritation in his right hand. … Odubel Herrera and Aaron Altherr rehabbed with triple-A Lehigh Valley and should join the Phillies within the next week…Aaron Nola will pitch Saturday night against Marlins righthander Dan Straily.